The 97th Giro d’Italia rolls into Dublin next month in what is set to be one of the biggest sporting events in the world this summer. The annual stage race is ordinarily held in Italy, with some other countries receiving the sporadic honour of hosting some stages of their own. Alongside the Tour de France and Vuelta a España, the Giro is one of cycling’s Grand Tours, and the popularity of the race is unquestioned. The action is beamed to a global TV audience of around 775 million, and that doesn’t include those lucky few that attend in person and line the route. Both Northern Ireland and the Republic have been chosen to host the early stages, or ‘Grande Partenza’ of the big race this year. On May 9th the opening stage is a 22km team time trial through Belfast, starting at the Titanic museum and taking in the Newtownards Road, Stormont, Queen’s Bridge, the Ormeau Road, Stranmillis and the city centre. Stage 2 the following day will be a 218km foray from Belfast to Antrim, then to Ballymena, Ballymoney and Bushmills and on to the Giant’s Causeway, taking in the coastline from Cushendall to Larne, Carrickfergus and back to Belfast. Stage 3, on May 11th, sees the 200 or so riders attempt a 187km route across the border that will leave Armagh and travel to Richhill and Newtownhamilton before heading south, crossing the border at Forkhill en route to Dublin, via Dundalk, Castlebellingham and Drogheda. The Dublin portion of the route is expected to draw in thousands of enthusiastic supporters, with the hub of the activity set to be centred on the Giro Fan Park in Merrion Square on May 10th and 11th. The park will play host to the Irish Cycling Show as well as a whole range of Italian and cycling themed activities and food stalls. Thousands of visitors are expected to congregate on the capital over the weekend in question, and organisers are hoping to turn the city pink as a show of support for the race. While the leader of the Tour de France wears yellow, the cyclist they all want to catch in this one is always hard to miss in the pink jersey. The economic benefits of the event both North and South will be immediate and fruitful. The fact that the race is seen by such a vast TV audience worldwide means the tourism prospects are lucrative. If Ireland can do as it has done in golf and advertise itself as a haven for competitive and hobby cyclists, then the potential number of new visitors will be great. The number of people visiting for the weekend of the Irish stages alone is set to be in the many thousands. For its size, Ireland has actually been quite successful on the world cycling stage. Roche’s own rise to glory was mirrored in the 80s by that of his fellow countryman, Seán Kelly. The Waterford man won nine monument classics and 193 professional races in total in a hugely successful career. Other Irish cyclists have also managed to win stages of the Tour de France, namely Martin Earley, Seamus Elliott, and Dan Martin. Cycling clearly runs in the Roche family too, with Stephen’s son Nicolas twice a national champion who has many top ten finishes in Grand Tour stages to his name already. England will play host to their own cycling event this summer, with the Grand Depart of the Tour de France set to take place in Yorkshire on July 5th. But it is the Giro d’Italia that will catch the imagination of potential Irish cycling enthusiasts next month. The race began in 1909 as a novel way to increase sales of famed Italian newspaper La Gazzetta dello Sport. Although the leader wears the pink jersey, there are other classifications up for grabs, such as the points classification for sprinters, the mountains classification for climbers, the young riders classification for riders under 25, and the team classification. 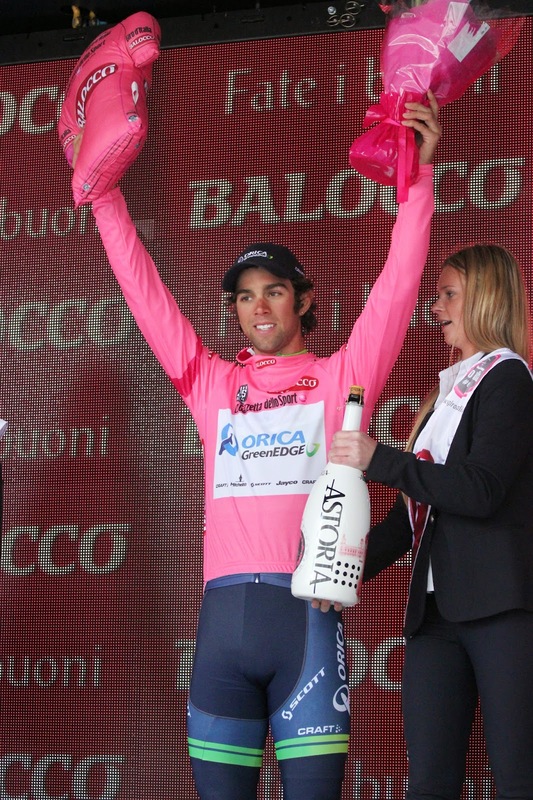 The reigning champion and last year’s pink jersey winner was Vincenzo Nibali of team Astana, and this year riders like Cadel Evans (BMC Racing), Ivan Basso (Cannondale) and Joaquím Rodríguez (Katusha) will be hoping to have nabbed his crown by the final finish line in Trieste on June 1st. It promises to be a fantastic spectacle; for a few days in May, our beautiful Emerald Isle will instead be pink.